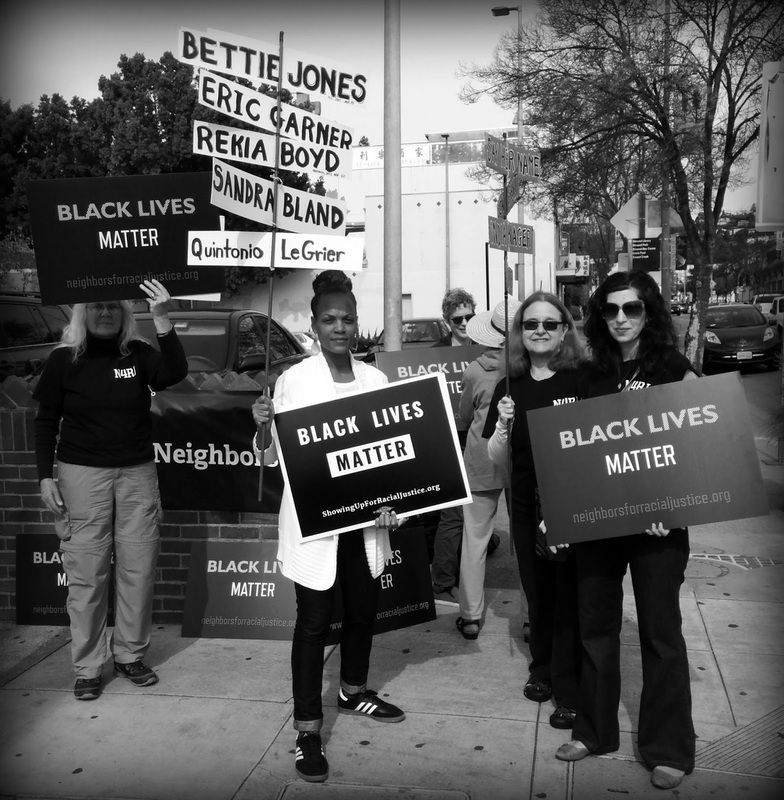 Every Saturday, from noon to 1pm, some of us gather at the corner of Fruitvale Avenue and MacArthur Boulevard to hold a #BlackLivesMatter vigil. Judging from the increasing number of honking horns and waving arms and thumbs up and street-corner conversations each successive week, support for our message seems to be growing. It's interesting what people have to say. A White woman told me one Saturday that we should really be taking our message up the hill to Montclair, because up there, people don't seem to understand that Black Lives Matter. I responded that we have multiple audiences for our message. Recently, a Black man suggested to one of our members that we should really be taking our message to East Oakland. It's the young, Black men in East Oakland, he said, who really need to hear that Black Lives Matter. Today, a young Black woman called out her car window to me that we should be in Montclair or Piedmont with our message. Here in the Dimond, she said, people already know that Black Lives Matter. Around that time, an older White man in a pickup truck flipped me the bird, and I flipped him the peace sign. He slowed down his truck and started to pull over. He seemed unsure of his plans, but he stopped his truck and opened his door. He yelled some things that weren't very nice, but I don't remember what they were. Then he yelled that all lives matter. He yelled it several times. "You're right!" I yelled back. "Thank you! All lives do matter!" And he went on his way. In that same period of about five minutes, Black people and White people alike kept telling me and my friends that all lives matter. I kept agreeing with them. Some weeks back, a young man who may have been of Islander heritage, came up to me to talk, and told me that all lives matter. I simply agreed with him. Then he asked why we were there with our message. I told him that most people believe that all lives matter. It doesn't need to be said. He raised his eyebrows in a thoughtful way and nodded his head. He seemed to understand. So while tons of people honk and wave and give us the thumbs up, there are always a few who question either our message or our location. But something else happened today to make it clear that we were in the right place with the right message. Three of our members were carrying signs with names of people who have been killed by the police. All the names on all three signs are different. We could add hundreds more names if we could still carry the signs. We could never keep up adding new names each week, though. There are just too many. But today a young man approached Judy, who happens to have made all the name signs. He asked to take a picture of her with her sign. One of the names on her sign meant a lot to him: the name of his cousin. He explained that his cousin had been with a group of people when the cops showed up. His cousin got scared and ran. A cop shot and killed his cousin. It meant something to that young man that we were out on that corner with that message. And it means a lot to many, many folks. We're going to continue with our message, and we're going to keep it close to home. In the Dimond.